Boy, did Mom & Grandma bring back a lot of fabric, notions, & other cool stuff from Ohio this week. They forgot me back some new toys though. Plus, we got more fabric from the nice man in the brown truck. I like him. Sometimes, he brings me treats and pets me. He always talks to me while Grandma or Mom scribble on a funny box for him. We are not going to be open this Monday, September 1, 2014. Mom says it's Labor Day and we're taking a day off for this holiday. I'm still kinda confused. If it's Labor Day, shouldn't everyone work even harder that day? We've been real busy this week, Mom hasn't had a chance to take a photo of the new fabrics yet. I almost forgot! We are taking Pre Orders for the Disney Olaf Panel coming out in January. There will only be one printing of this limited edition Disney Frozen Panel. If you have a little one who loves Olaf, you may want to Pre Order it so you can get it as soon as it comes in. We also have some Disney Frozen flannel, fleece & more cotton fabrics coming in. They'll be here in November. This stuff is HOT!! Mom made up a book showing everything that is coming in. You can Pre Order any of the Frozen fabrics scheduled to come in. Don't forget the Endless Mountain Quilt Guild Quilt Show at the Lynch-Bustin Elementary School in Athens, PA on September 27 & 28. 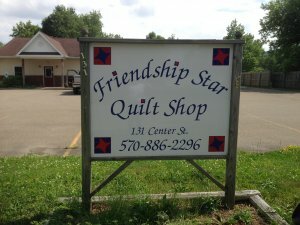 There will be a Friendship Star Quilt Shop booth there & the Shop will be open 10a-6p on Saturday, September 27th just for the Quilt Show. 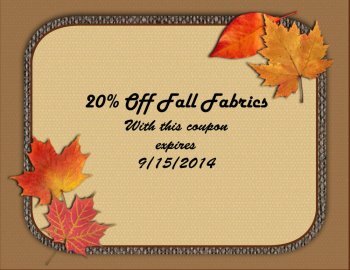 Here's a coupon for you from me, Obi! Mom & Grandma will be surprised when you bring this in! I'll bet Mom will get me a new toy for this idea!